We made a New Zealand South Island road trip by campervan and saw the best of this beautiful island. This post will show you our South Island itinerary on the map and photos of the amazing landscapes we were traveling through. We bought flights to Christchurch where we rented a campervan at the airport. From Christchurch we took the Arthur’s Pass road to West Coast and continued down the coast. At Haast we turned inland towards Wanaka and Queenstown and then took the inland road back, via Mount Cook and Lake Tekapo. You will see our South Island road trip map with a driving itinerary below. This is one of the winding mountain roads we traveled along, the road from Queenstown to Wanaka. As you can see New Zealand roads are good and wide. It’s just the bridges that at times are very narrow but don’t worry, they are wide enough for trucks, buses – and campervans. New Zealand South Island is a real nature destination. 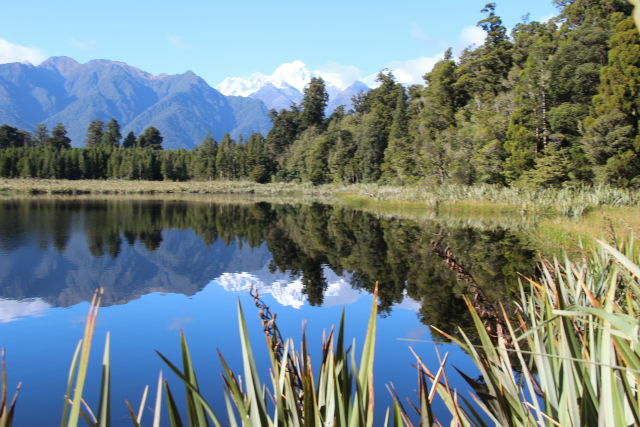 The whole island is full of nature wonders and everything is very clean since New Zealand is very rural. You will notice you’re almost alone on the road and that it’s always a long drive to the next village – that probably only has one or two houses. South Island has a high mountain range in the middle stretching all the way from south to north. So South Island is a mountain island where the highest peaks are snow-capped. 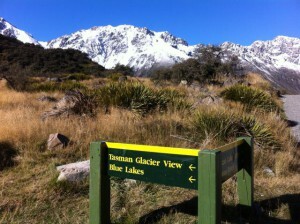 South Island has hundreds of glaciers and as many small mountain lakes. What makes the island so special is that all this is combined with subtropical rainforest that fills the slopes lower down. I recommend you make this trip in a campervan. You don’t have to worry about meals and accommodation nor plan too much, you just travel. Driving in New Zealand is easy, just remember to keep left at all times. So this is our 11 day South Island driving itinerary, 1600 km according to Google, plus a number of side trips. In all maybe 2000 km or something. That makes 180 km per day which is not much. 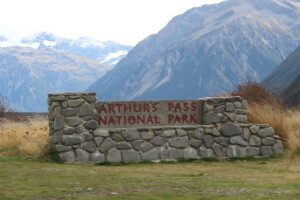 The map shows the Arthur’s Pass road that we took from Christchurch to West Coast. and down along it. In West Coast we followed the main road down to Haast where we turned inland to Queenstown (between Cromwell and Kingston that are marked on the map). We then took the inland road to Mount Cook and Lake Tekapo and on to Christchurch. You can see our whole South Island road trip on the map. The map says you can drive it in 20 hours which is a joke. We used 11 days and 180 km always took us most of the day since we stopped so much. We hiked where it was most scenic, mainly short hikes, had a lunch or coffee and continued driving. And we stayed the nights in holiday parks or campsites that there are many of. You just have to know where they are. 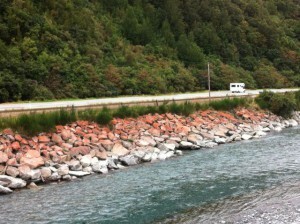 For information on holiday parks check out my post New Zealand in Campervan: Christchurch to Greymouth. As we saw so much in 11 days I divided our South Island road trip in 9 sections and made separate blog posts on each. The posts are here. My first post will tell you how to prepare for your New Zealand road trip and how to rent a campervan. Then we cross the mountains from Christchurch in the east to Greymouth in the west. Driving distance Christchurch to Greymouth is 250 km and you will climb up to 920 m. See my South Island road trip map for exact locations and driving route. So we came to West Coast where we first took the coastal road (partly in rainforest) north to Punakaiki Pancake rocks that really look like pancakes. Then we turned back south and followed the West Coast road all the way to Haast. We were travelling in autumn and it was cloudy and a sometimes rainy at first but lower down the coast the skies were clear and we had beautiful sunshine. Our West Coast drive was 370 km which we did in two days, spending a day hiking to Fox and Franz Josef glaciers. Dont’ miss the glaciers on West Coast. 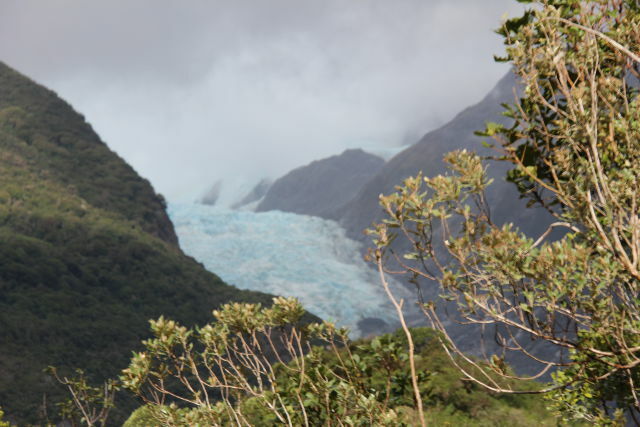 We stayed overnight in a camping site deep in the rainforest and then hiked to both Franz Josef and Fox Glaciers. They are located close to each other and just a short hike is needed from the car parks. Franz Josef Village also has wonderful hot pools, try the pools after the hikes! The next night we stayed at Haast from where we turned inland, up the mountains along Haast River. While it was rainforest on warm on the coast the mountains had a real autumn with foliage and the weather up there was cold. Mostly below freezing point at nights and only around 7 to 10 C at daytime. But we didn’t mind the cold weather, we walked on trails and our campervan had heating and was warm. 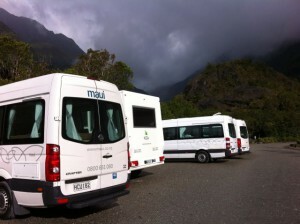 We saw many mountain lakes like Lake Hawea and Lake Wanaka and stayed a night close to Wanaka. On the way down we took the Cromwell road to Queenstown. Queenstown was the first city after we had left Christchurch, so we enjoyed city life. We went to restaurants, shops and cafes and walked on Lake Wakatipu shores. But we made two fantastic short trips out from Queenstown, first to Arrowtown in the north and then to Kingston in the south. Arrowtown is an old mining town with historic buildings, it’s a very pretty place. Kingston is a tiny community at the southern edge of Lake Wakatipu. We went there since we wanted to drive along Wakatipu lakeshore and see the lake and Kingston was where we turned back. As we didn’t travel longer south from Queenstown we turned back towards Christchurch. We took the road to Mount Cook National Park that has the highest peaks of South Island. And to see more peaks and snow we took the Crown Range mountain road to Wanaka. In Wanaka we returned to our campsite Glendhu Bay. It was a great place on the lakeshore and close to hiking trails. But we still had a long drive across Central Otago. A beautiful area and exactly what you expect to see in New Zealand. The drive from Queenstown to Mount Cook was 300 km in all. 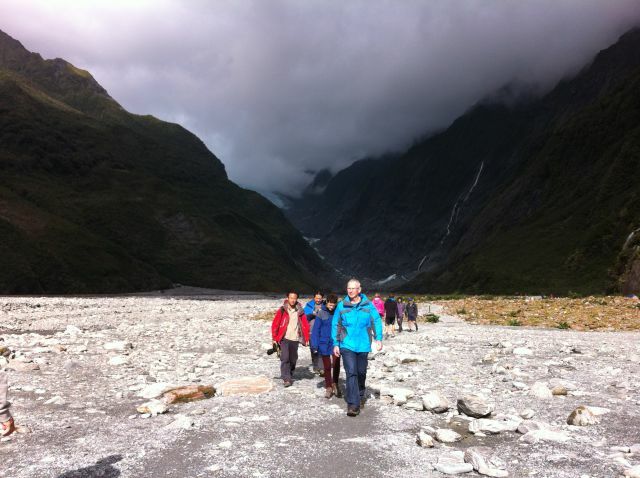 We were on the top of New Zealand, and we were that even when we didn’t climb Mount Cook, 3754 m. Instead we walked two short hikes: to Tasman Glacier and to Mueller Glacial Lake. Aoraki Mount Cook National Park looked stunning in clear autumn weather. I think autumn is the best time to visit New Zealand, the weather is very clear and autumn colors fantastic. We stayed a night in a camping centre south of Aoraki village and as we suddenly got some problems with our gas bottle we exceptionally prepared our dinner in the campsite kitchen, together with German climbers and Chinese tourists. And then, last but not least, there was the long 370 km drive to Christchurch in green Canterbury farming landscape. But before Canterbury we were still in the Otago highland and there were the two magic lakes: Lake Pukaki and Lake Tekapo. I could take hundreds of photos on these lakes – and I really did. This is just a sample of my photos and the post on the Mount Cook to Christchurch drive includes another sample. Lake Tekapo has the famous Church of the Good Shepherd on the lake’s edge and there are the Tekapo Hot Springs located next to the holiday park. And one more thing on the way to Christchurch: the turquoise Rakaia Gorge. And then suddenly we were back in Christchurch, the city recovering from a severe earthquake. We took a tram ride and the cable car to the top of Banks Peninsula where we hiked, once more before taking our flight back to Sydney and on to Europe. If you have made a South Island road trip, was it like ours or where did you go? What would you recommend in addition to my itinerary? Or instead of it?